Two adjectives frequently used to describe Yasufumi Iwasaki are tirelessly committed and generous. For Iwasaki’s extraordinary dedication to his students and his impact as a teacher, advisor, mentor and curriculum developer, he has won the 2014-15 Elliott Dunlap Smith Award for Distinguished Teaching and Educational Service in the Dietrich College of Humanities and Social Sciences. 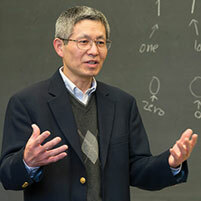 Iwasaki, associate teaching professor of Japanese in the Department of Modern Languages, joined the Carnegie Mellon University faculty in 2005. Iwasaki teaches six courses per year – from elementary Japanese to advanced levels – and serves as the coordinator of the Japanese Studies Program. Iwasaki said that his favorite part about teaching used to be lecturing, but that has changed during his time at CMU. “I have come to realize that I can help more when students are using language on their own, and I provide feedback. They immediately pick up my comments, and it helps them learn,” Iwasaki said. One accomplishment that he is most proud of achieving is creating materials for three levels of Japanese instruction that other instructors in the program can use. Iwasaki also believes that the Modern Languages Department’s approach to teaching foreign languages differs from other universities – and that their students benefit from the goal-driven methods. “Our department places language study into the much wider field of the study of culture. Learning outcomes include speaking, listening, reading, writing and learning of culture,” Iwasaki said. Learn more about the Elliot Dunlap Smith Award.